TIE BREAKING POLICY: for all Annual Obedience Trophies – to break a tie the Awards committee will consider the fourth highest score (sixth highest score for the Super Dog Trophy) submitted with the award application. Failing that, the Awards committee will contact those involved to establish which dog defeated the most in competition enroute to a single HIT selected by the applicant. 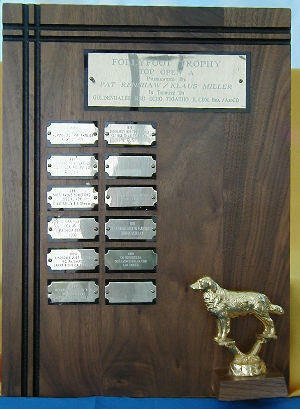 Awarded to the Golden who has the top three qualifying scores in Novice A and whose handler was a complete novice. This award is intended for the Novice owner who has never before put an obedience degree on a dog. Awarded to the Golden with the top three (3) scores in Novice A. Awarded to the Golden with the top three (3) scores in Novice B. Awarded to the Golden with the top three scores in Open A. Awarded to the Golden with the top three scores in Open B. Awarded to the Golden with the top three scores in Utility. Awarded to the Golden who obtains the highest combined score in Open and Utility at the same trial. 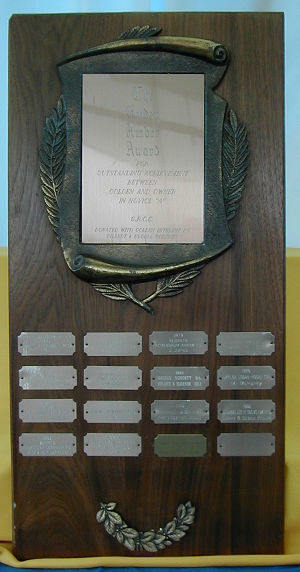 Awarded to the Golden with the five (5) highest scores in Open over 197 and the five (5) highest scores in Utility of 97. Awarded to the Golden Retriever who has obtained the 3 highest combined Open and Utility scores while working towards the OTCHX/MOTCH.